The Silver Dollar galaxy, NGC 253, is a giant, barred spiral galaxy about 70000 light-years long located in the constellation Sculptor, about 13 million light-years from the Milky Way. It is the brightest member of the Sculptor Group of Galaxies, and is also one of the intrinsically brighter galaxies around us, surpassed only by the Andromeda galaxy and the Sombrero galaxy. Known for its strong X-ray and gamma-ray emission,NGC 253 probably originated close to the massive black hole at its nucleus. It exhibits a high rate of star formation in both the center and the spiral arms, which has led to the suggestion that a collision with a dwarf galaxy occurred about 200 million years ago. An international team of researchers led by Aaron Romanowsky of San José State University has used the Subaru Telescope to identify the faint dwarf galaxy disrupting the nearby giant spiral. The observations provide a valuable glimpse of a process that is fleeting but important in shaping galaxies. "The outer regions of giant galaxies like our own Milky Way appear to be a jumble of debris from hundreds of smaller galaxies that fell in over time and splashed into smithereens," said Romanowsky. "These dwarfs are considered building blocks of the giants, but the evidence for giants absorbing dwarfs has been largely circumstantial. Now we have caught a pair of galaxies in the act of a deadly embrace." 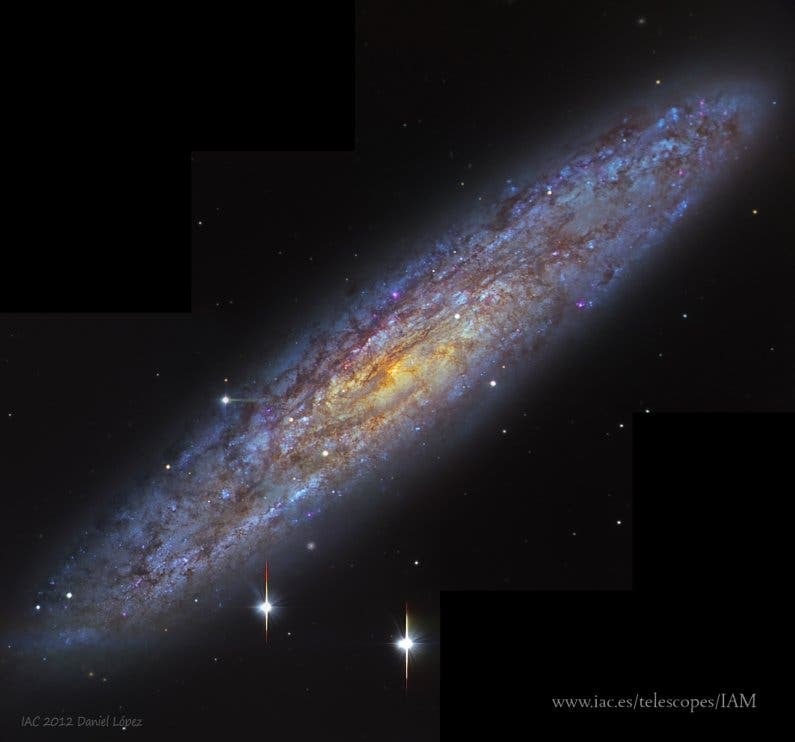 The two objects in the study are NGC 253, also called the Silver Dollar galaxy, and the newly discovered dwarf NGC 253-dw2. They are located in the Southern constellation of Sculptor at a distance of 11 million light years from Earth, and are separated from each other by about 160 thousand light years. The dwarf has an elongated appearance that is the hallmark of being stretched apart by the gravity of a larger galaxy. "The dwarf has been trapped by its giant host and will not survive intact for much longer," said team member Nicolas Martin, of the Strasbourg Observatory. "The next time it plunges closer to its host, it could be shredded into oblivion. However, the host may suffer some damage too, if the dwarf is heavy enough." The interplay between the two galaxies may resolve an outstanding mystery about NGC 253, as the giant spiral shows signs of being disturbed by a dwarf. The disturber was previously unseen and presumed to have perished, but now the likely culprit has been found. "This looks like a case of galactic stealth attack," said Gustavo Morales of Heidelberg University. "The dwarf galaxy has dived in from the depths of space and barraged the giant, while remaining undetected by virtue of its extreme faintness." 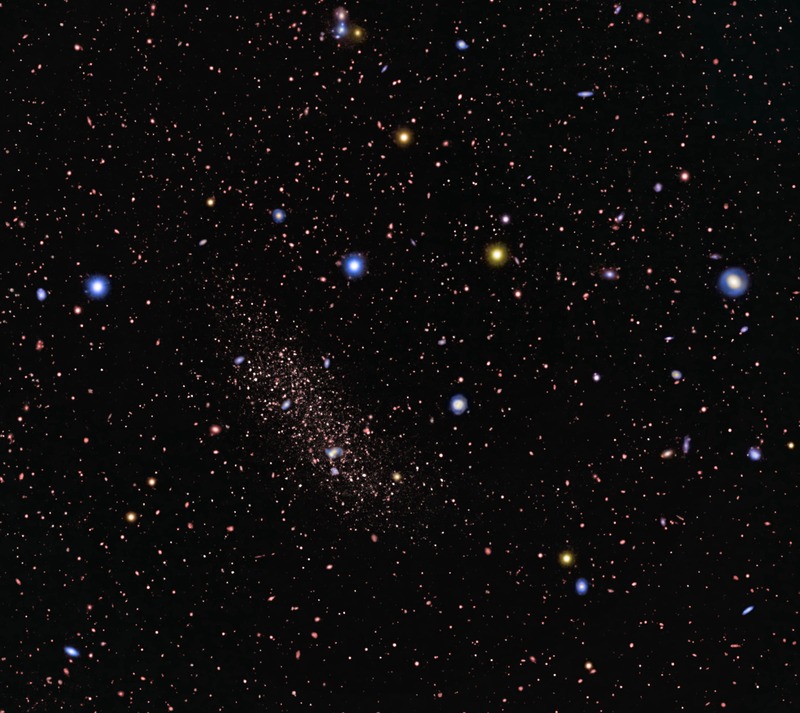 Close-up view of the dwarf galaxy NGC 253-dw2 below. The closely packed red dots show that it is composed of individual stars. The discovery of NGC 253-dw2 has an unusual pedigree. It began with a digitalimage of the giant galaxy was taken by astrophotographer Michael Sidonio using a 30 centimeter (12 inch) diameter amateur telescope in Australia. Other members of the international team noticed a faint smudge in the image and followed it up with a larger, 80 centimeter (30 inch) amateur telescope in Chile, led by Johannes Schedler. The identity of the object was still not clear, and it was observed with the 8 meter (27 foot) Subaru Telescope on the summit of Mauna Kea in Hawaii, in December 2014. "In the first image, we weren't sure if there was really a faint galaxy or if it was some kind of stray reflection," said David Martínez-Delgado, also from Heidelberg University. 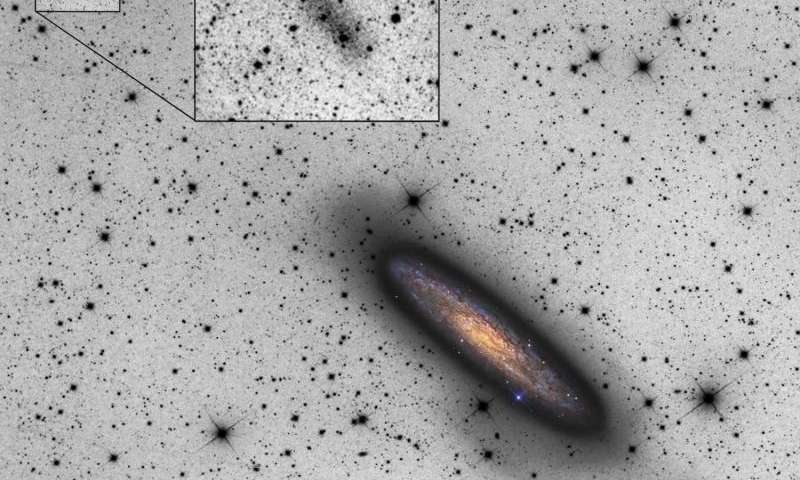 "With the high-quality imaging of the Suprime-Cam instrument on the Subaru Telescope, we can now see that the smudge is composed of individual stars and is a bona fide dwarf galaxy. This discovery is a wonderful example of fruitful collaboration between amateur and professional astronomers." Image credit: Silver Dollar Galaxy top of page http://www.iac.es/telescopes/IAM; Copyright © 2015 R. Jay GaBany (Cosmotography.com) Zachary Jennings (University of California, Santa Cruz), and National Astronomical Observatory of Japan (NAOJ)). New Dark-Matter Discovery: "Nine Concentrations Each the Mass of a Galaxy Cluster"
Milky-Way Size Dark Galaxies Found in Coma Cluster –"Enveloped by Something Massive"
Dwarf Galaxies "Challenge Our Understanding of How the Universe Works"
Read Alistair Reynolds SciFi Story –"A Robotic Interstellar Probe of a Real-World Discovery of Two Alien Planets"
Rocky Planet with a 3-Day Orbit –"Only 21 Light-Years Away"
Monstrous Galaxy –"Observed Near the Edge of the Known Universe"